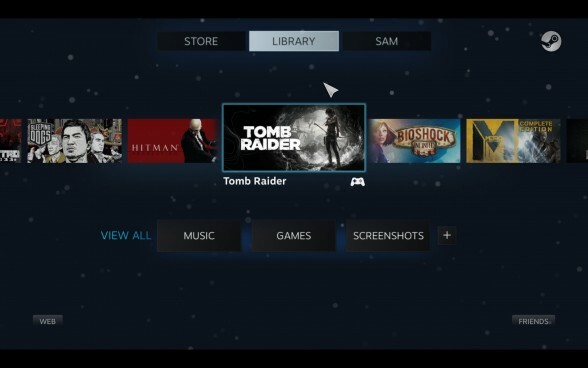 While Valve and their PC OEM partners created a lot of hype during the show, the Steam Machine concept has pretty much fizzled out in the past year as Steam have made no big announcements regarding the status of their Steam OS or Steam Machines. With PC OEMs already having dumped hundreds of thousands of dollars into development of their custom Steam Machine designs, a number of them have decided to launch their product with or without the Steam OS or the official Steam Machine designation. 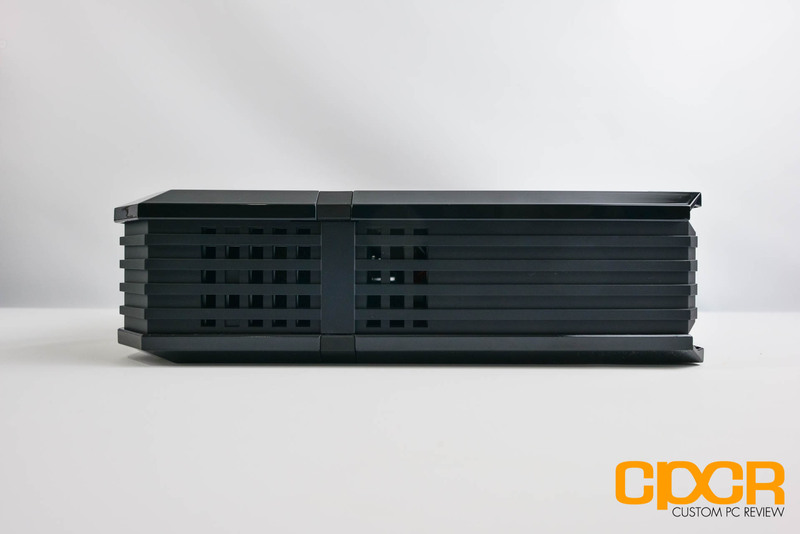 Last year, one of the companies that we met up with at CES was CyberPowerPC who showed us some prototypes of their upcoming Steam Machine. Although still a prototype at the time, we were quite impressed at their product which combined both a great design and powerful hardware in a premium package we’ve never seen from the company. Now, nearly a year after the initial introduction of the CyberPowerPC Steam Machine prototype, CyberPowerPC recently provided us a review unit of their final product, the Vapor, which will be marketed under Syber, a new sub-brand of CyberPowerPC. Syber will offer the Vapor in three preset configurations – the Syber Vapor A, the Syber Vapor I, and the Syber Vapor Xtreme. 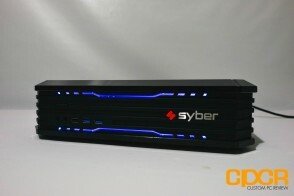 In the entry level the Syber Vapor A starts at a mere $599 and includes an AMD Athlon X4 840 coupled with an AMD R9 270 graphics card while higher end systems such as the Syber Vapor Extreme could pack an Intel Core i7-4790K and a Nvidia GeForce GTX 980 for $1,499. 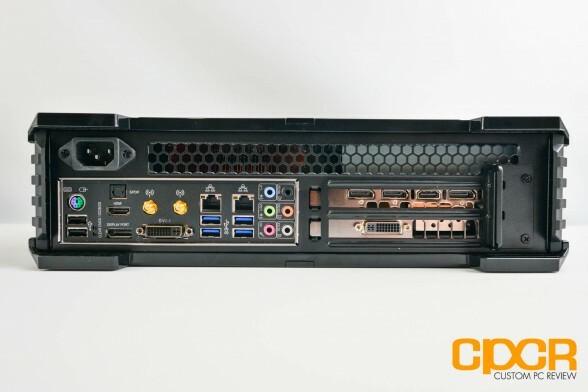 As usual of any CyberPowerPC built system, customers can also customize any system to their liking via the CyberPowerPC website. 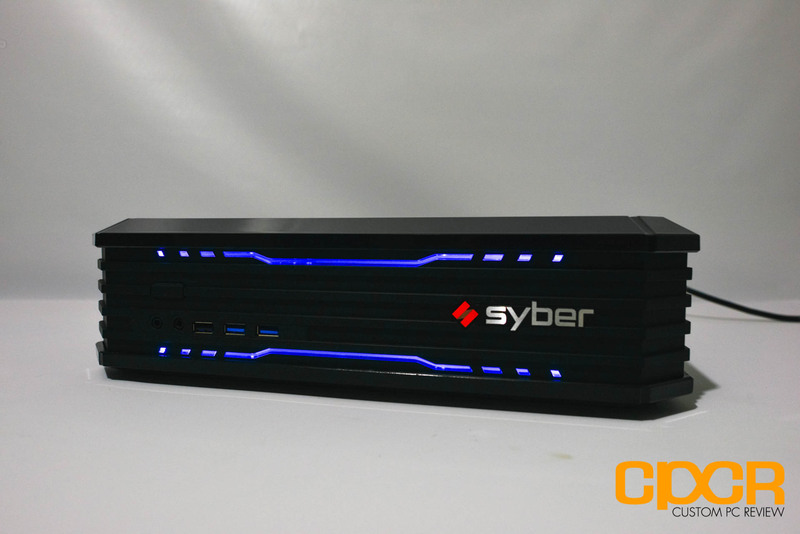 For our review today, Syber provided us with a custom configured Syber Vapor Xtreme system complete with Intel Core i7-4790K CPU, 8GB DDR3 memory, EVGA GeForce GTX 980 Superclocked graphics card, Kingston SSDNow V300 SSD, and more. Considering all this powerful hardware is being packed into a chassis only 13.8″ wide, 13.6″ deep and 3.9″ tall, that’s quite impressive. Additionally, Syber was quick to point out that they’re currently the only gaming PC console maker to provide both retail and customer configured built to order systems. That said, let’s take a closer look. 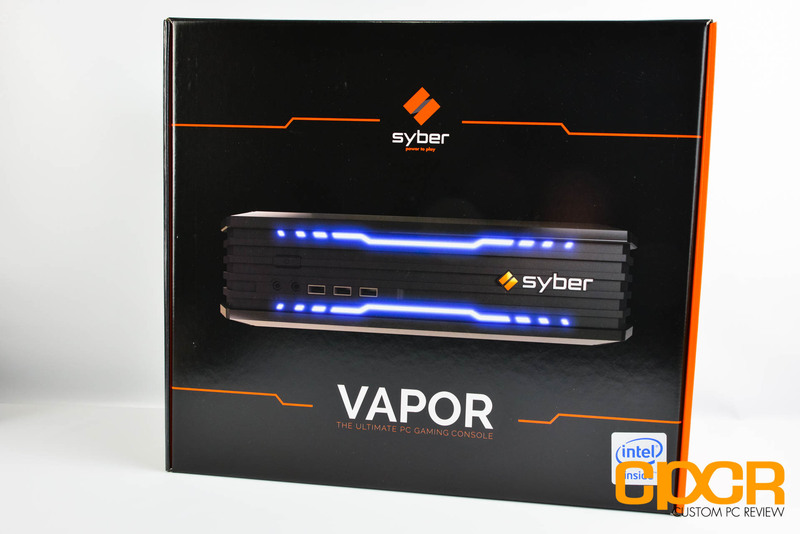 Here’s a look at the packaging for the Syber Vapor Xtreme. It’s immediately apparent that CyberPowerPC is trying to make the Syber brand into a more separate, more premium entity than its parent company starting with the premium packaging for its products as we see here. 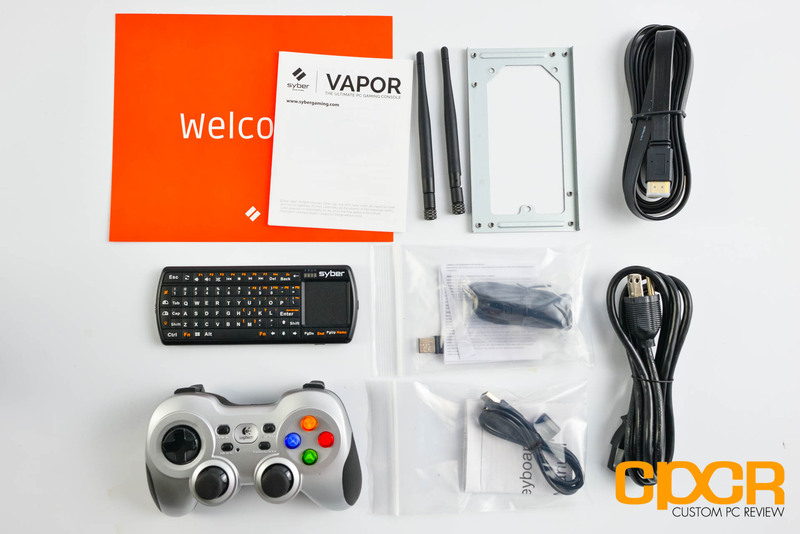 Included in the packaging we get a slew of accessories including custom made documentation, a power cable, a HDMI cable, wireless keypad with accessories, a Logitech F710 gamepad with accessories, two WiFi antennas, and a power supply bracket. Considering the wireless keypad retails for ~$20 and the Logitech F710 retails for ~$50, it’s a nice ~$70 value in accessories alone. 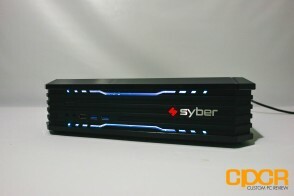 Here’s a look at the Syber Vapor Xtreme PC Gaming Console. This is a very similar chassis design to the prototypes we saw back at CES earlier this year. 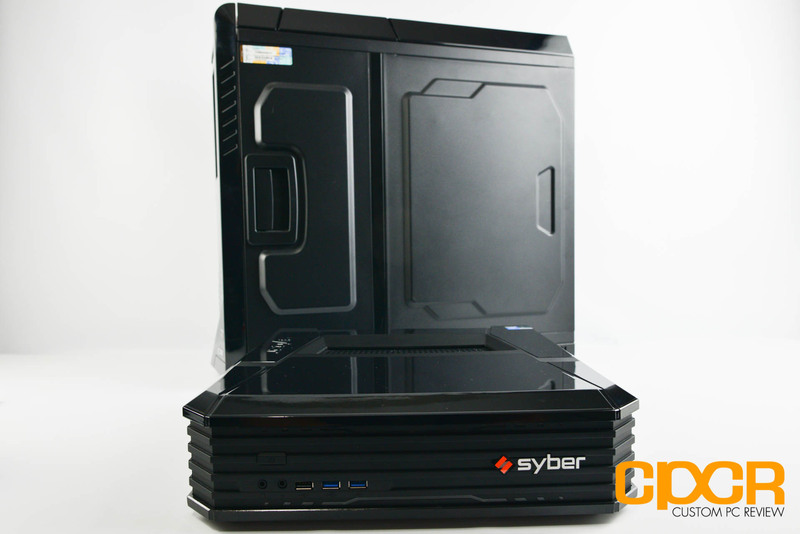 For this custom chassis, Syber has tapped longtime case partner AZZA to provide the chassis. Our sample came in black, but a white version is available as well. 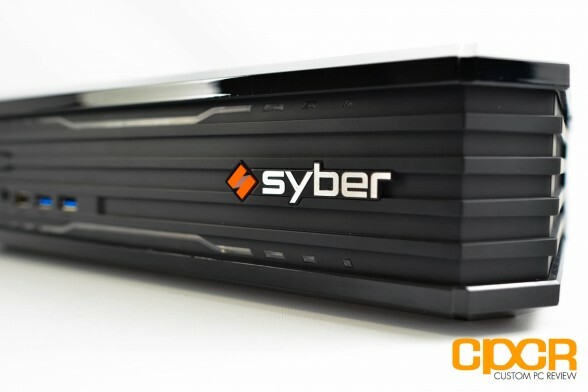 Those purchasing built to order systems directly from Syber will have the option of choosing chassis color while those choosing retail systems will receive white for the Syber Vapor A and I, and black for the Syber Vapor Xtreme. 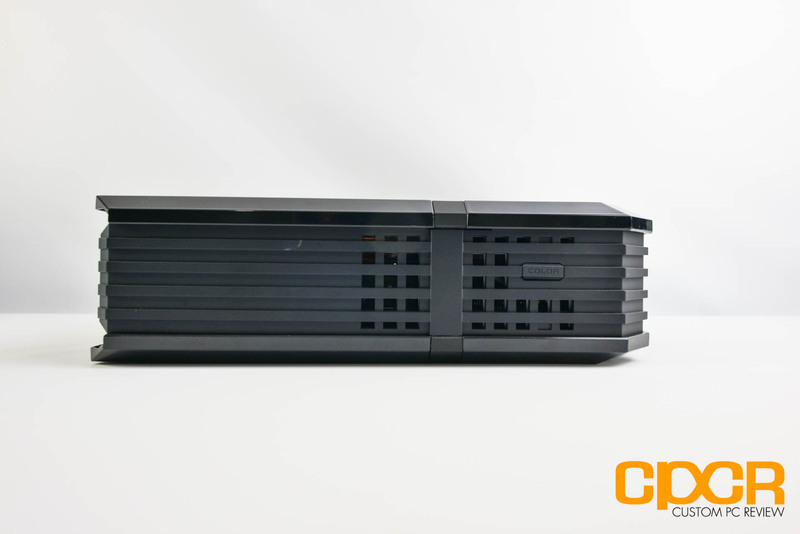 The chassis is relatively small measuring in at 13.8″ wide, 13.6″ deep and 3.9″ tall. 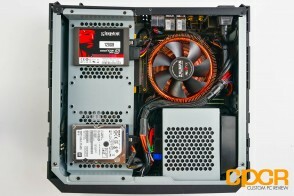 Here we can see it being dwarfed by a CFI Borealight full tower chassis. Just several years ago, even the idea of cramming such high powered components into such a small chassis was insane. 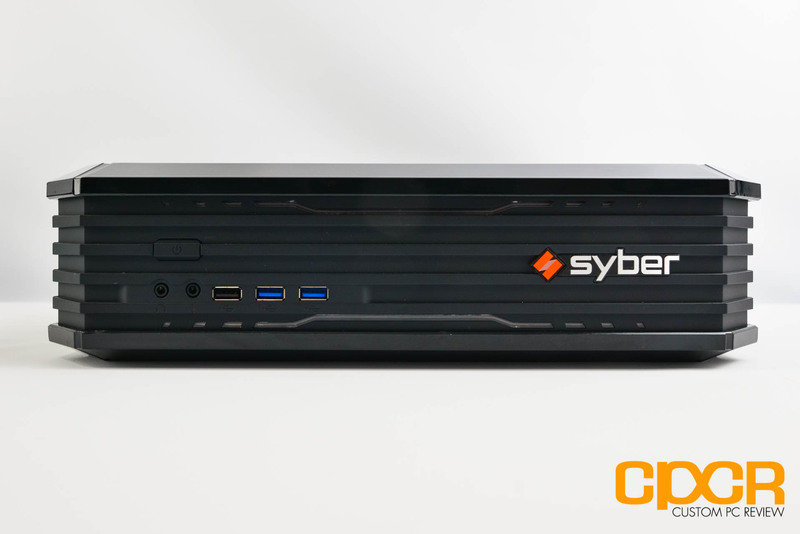 At the front of the Syber Vapor Xtreme chassis we get the power button, a 3.5mm headphone out, a 3.5mm microphone in, two USB 3.0 ports and one USB 2.0 port. Moving over to the left side, we get a color switch button for changing the LED colors on the front of the unit. 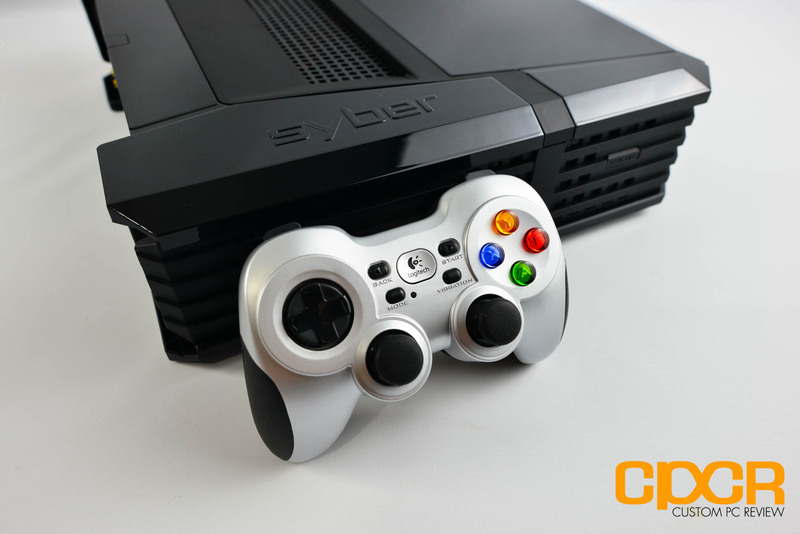 Users will also have the option of using breathing mode or color changing modes for the LEDs, but Syber has not included any sort of software or API to more finely tune the lighting from within the OS. At the top and bottom of the unit there’s a vent which allows for ventilation. There’s also additional ventilation holes on the sides of the unit as well. 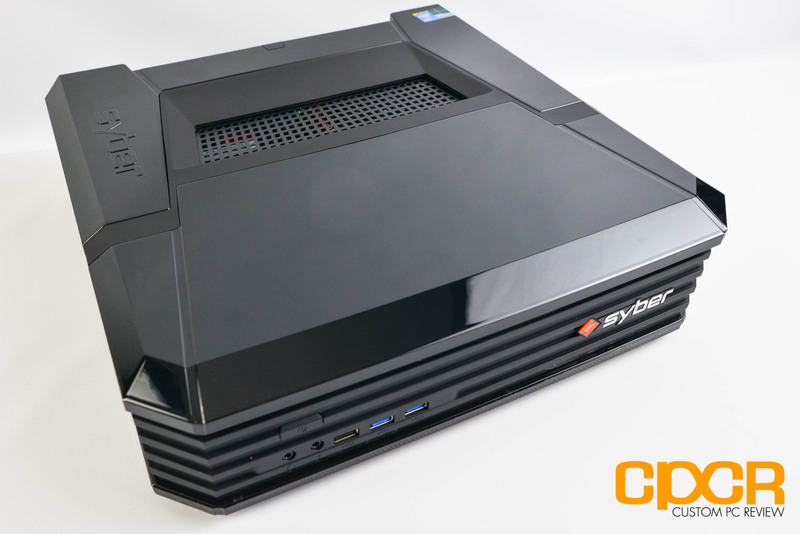 At the rear of the Syber Vapor Xtreme we get a 3-pin AC-in power port, PS/2 keyboard/mouse port, 2x USB 2.0 ports, 4x USB 3.0 ports, dual gigabit LAN ports, WiFi antenna ports, HDMI/DVI/DisplayPort onboard video ports, audio jacks, S/PDIF, and 3x DisplayPort/HDMI/DVI on the EVGA GeForce GTX 980 Superclocked ACX. Of course, depending on the configuration, this may vary. Additionally, we can see that there’s plenty of ventilation holes running across the length of the chassis. Removing the top panel, we can take a quick look inside the Syber Vapor Xtreme. 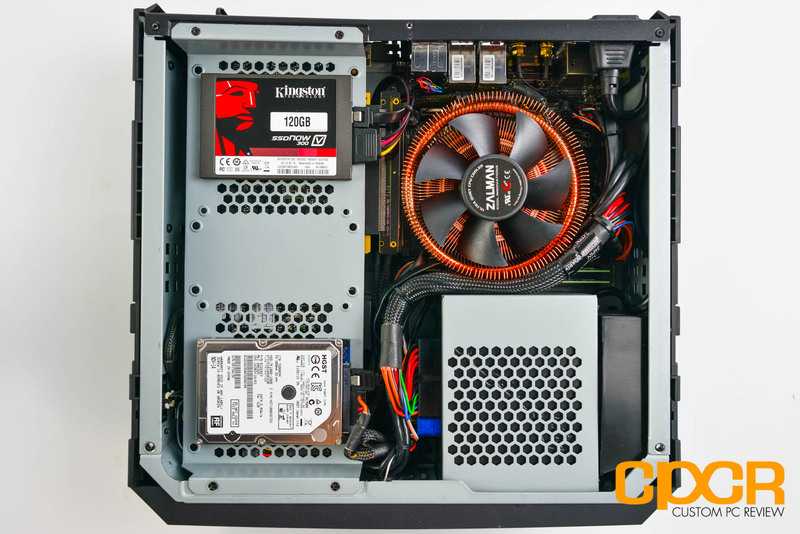 It always amazes me to look into some of these mITX gaming PCs and how much high end hardware some of these system builders have managed to cram into such a small chassis. 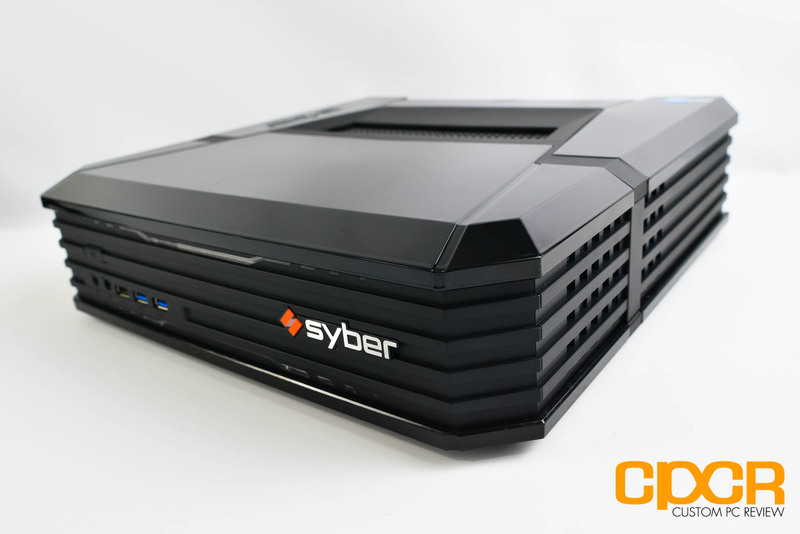 Looking at the Syber Vapor Xtreme from the top, we can see that the chassis is divided into two distinct areas with the left side of the chassis housing the storage and the graphics while the right side of the chassis is home to the motherboard, CPU, RAM, and PSU. Additionally, unlike a number of CyberPowerPC systems I’ve reviewed in the past, the Syber Vapor Xtreme uses very thick top and bottom panels. 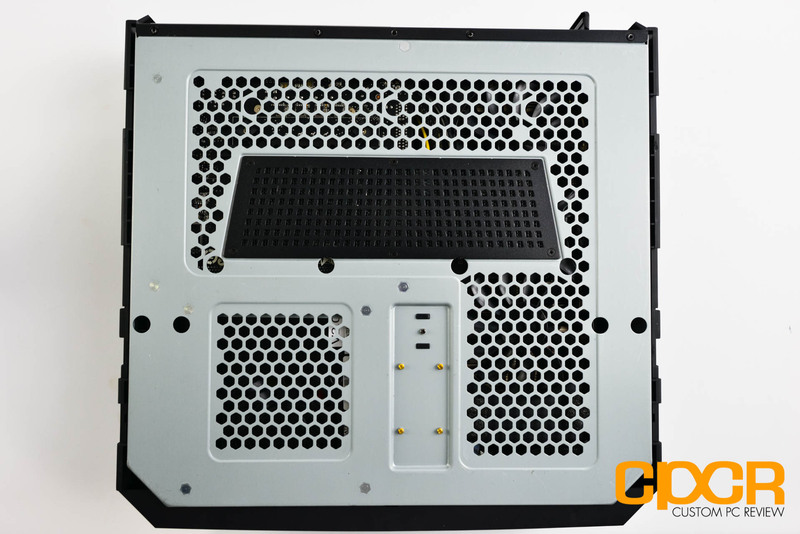 Although these panels are constructed of plastic, the interior of the unit is lined with a metal cage, which helps improve durability and reduce EMI from nearby electronics. 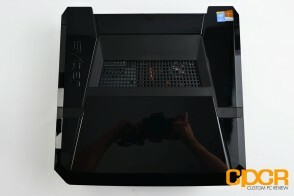 This system is built like a tank, which unfortunately can’t be said about most pre-built systems. Here’s a closer look at the right side of the chassis. On the upper right section of the chassis we get all the core components of the system such as the CPU/motherboard/RAM. 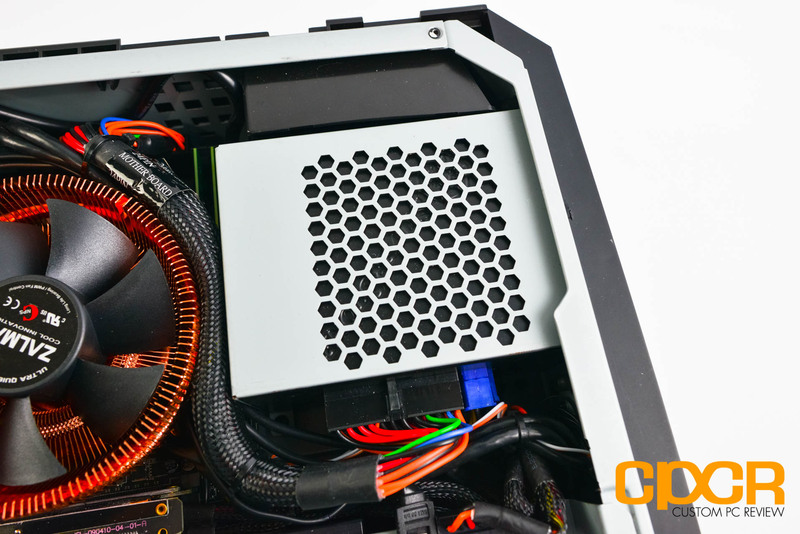 For our system, Syber included the massive Zalman CNPS8900 CPU cooler which is needed for cooling the powerful Intel Core i7-4790K. It’s strange to see that Syber will allow customers to pick the stock Intel cooler from their configuration page as well. While this may work for lower end processors, the Zalman cooler should be the only option available for higher end processors due to the higher heat generated by high end processors. On the left side of the unit we get a bracket which holds our Kingston 120GB V300 SSD and 2.5″ 1TB HGST 7200RPM HDD. There’s also a third spot in the middle for an additional 2.5″ drive if additional storage is needed. That said, this bracket appears to be quite versatile as 120mm fans or 3.5″ drives can be mounted as well. 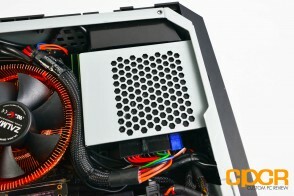 Although difficult to see, below the bracket is the EVGA GeForce GTX 980 Superclocked ACX mounted horizontally and connected via a flexible PCIe x16 extension. There’s plenty of room down here for graphics cards and every current generation single GPU graphics card should fit here without issue. Moving to the bottom of the unit, we can see that the entire system is mounted on a metal bottom plate. Not much to see here other than the fact that I do wish the holes down here were slightly larger to promote better airflow. Here’s a look at the Syber when it’s switched on. There’s a nice glow of LEDs up front, and a button on the side of the chassis is able to toggle through a variety of colors as well as several color modes such as solid, breathing and cycling. 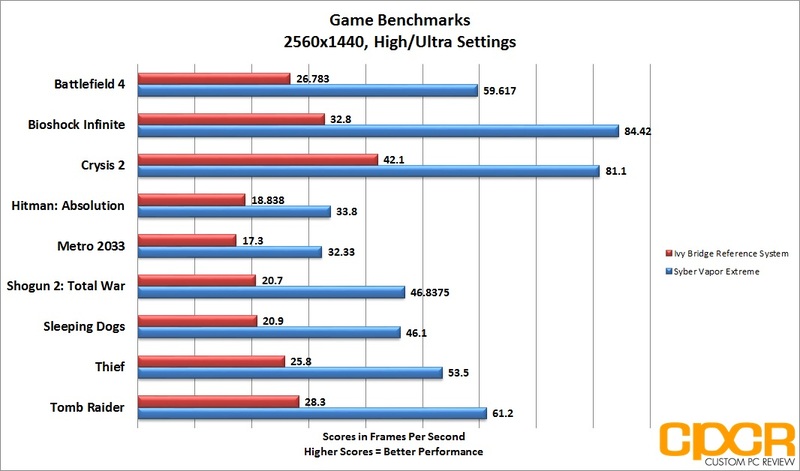 For reference, we’ll be using a well equipped Ivy Bridge based reference system for comparison. Our Ivy Bridge reference system doesn’t necessarily represent the fastest PC on the market, but it’s very well spec’d as a fantastic mid-range gaming PC capable of playing a majority of the latest games on the market at medium settings at 1080p. The specifications for our Ivy Bridge reference system are as follows. Special thanks to Gigabyte, Kingston, MSI and HSPC for sponsoring our reference system! 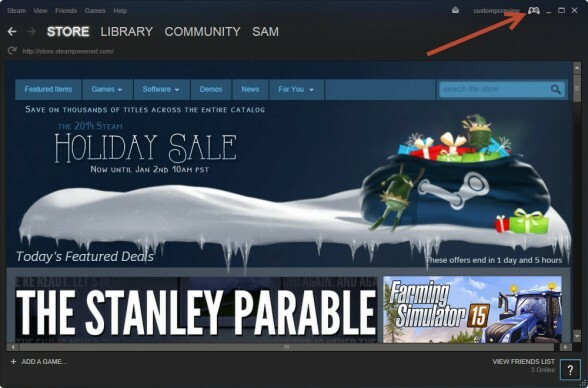 Upon boot, we’re greeted to Steam’s big picture mode. Within big picture mode, everything is optimized for the big screen and it makes it very easy for gamers to purchase and play games. Of course, Steam’s Big Picture Mode isn’t necessarily restricted to the Syber Vapor Xtreme. Those who’d like to test Steam Big Picture Mode can hit the joystick icon at the top right of the main Steam app. 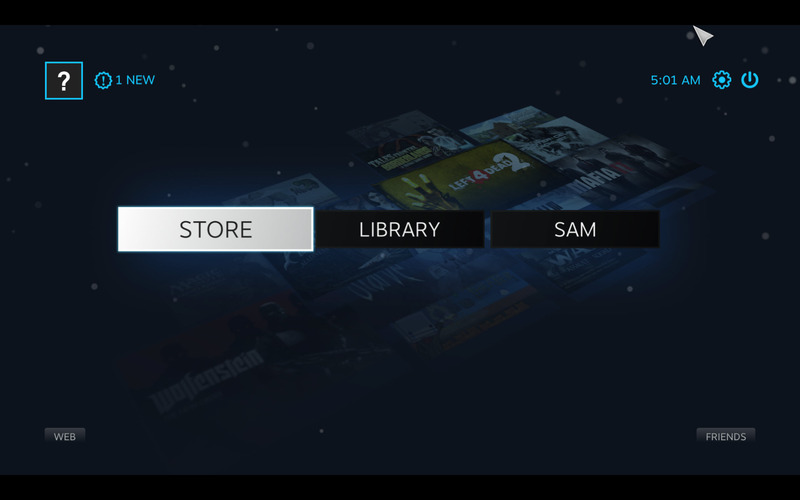 As far as I’m aware, Steam is currently the only digital distribution platform that has an option for the UI to be optimized for the big screen. 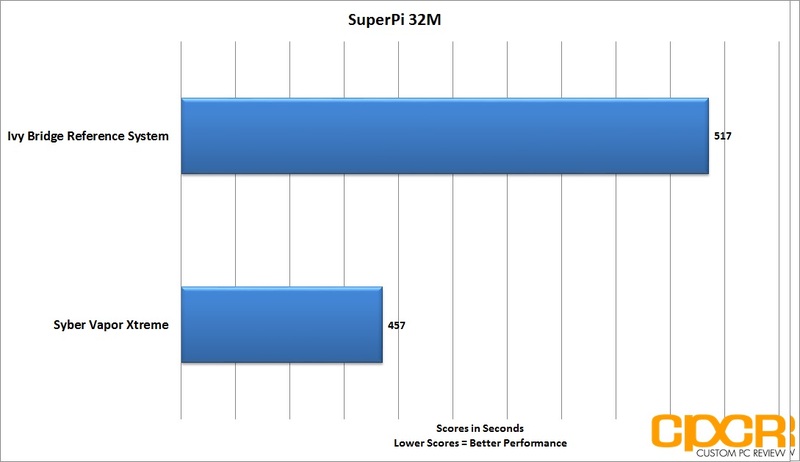 SuperPi is a single threaded benchmarking tool which for our purposes simply calculates pi for us and records the time to calculate 32 million digits after the decimal point. WPrime is a multi-threaded benchmarking tool which for our purposes simply calculates pi for us and records the time to calculate 32 million digits after the decimal point. 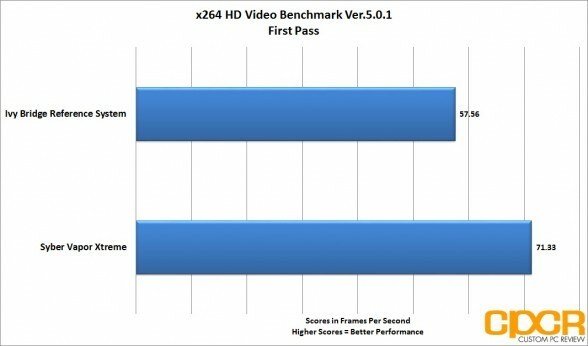 x264 HD video benchmark tests how fast the system can encode a 1080p video into a high quality x264 video file. 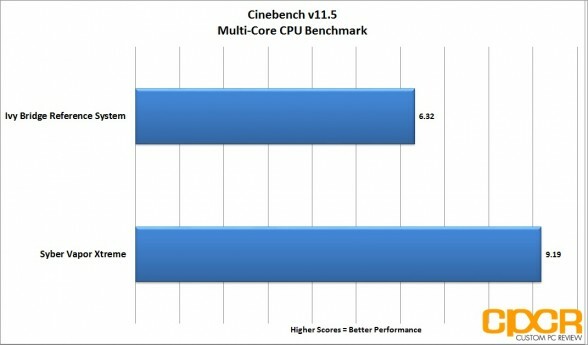 The most recent 5.0.1 release includes a more advanced benchmark script to better stress test newer multi-core processors. 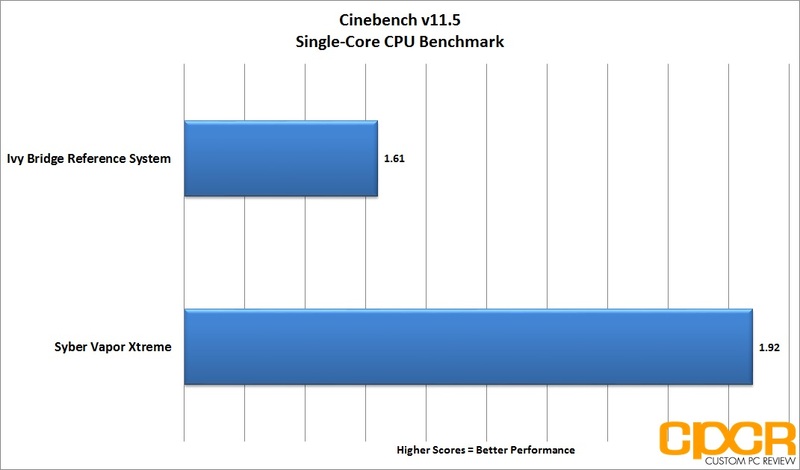 Cinebench is a real world benchmark that tests system performance using the Cinema 4D animation software. 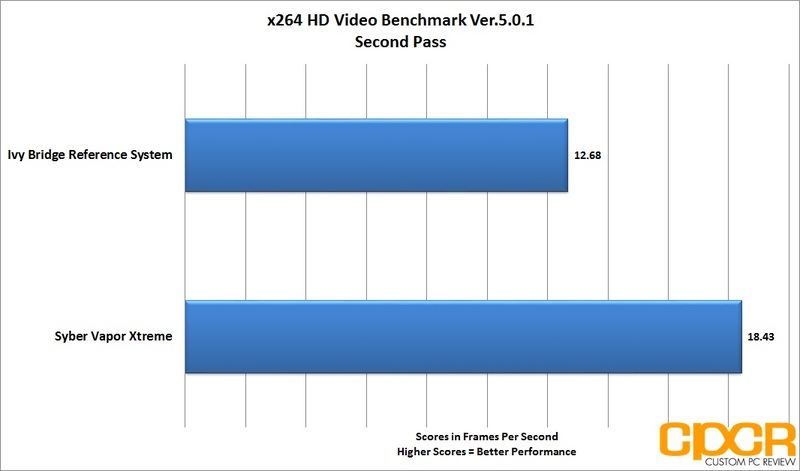 For our benchmarking, we’ll be testing multithreaded performance only. The Intel Core i7-4790K is currently the fastest mainstream Intel processor around and its performance reflects that very well. In our testing, the Syber Vapor Xtreme’s performance easily surpassed that of our Intel Core i5-3570K Ivy Bridge Reference System especially in multi-threaded applications. 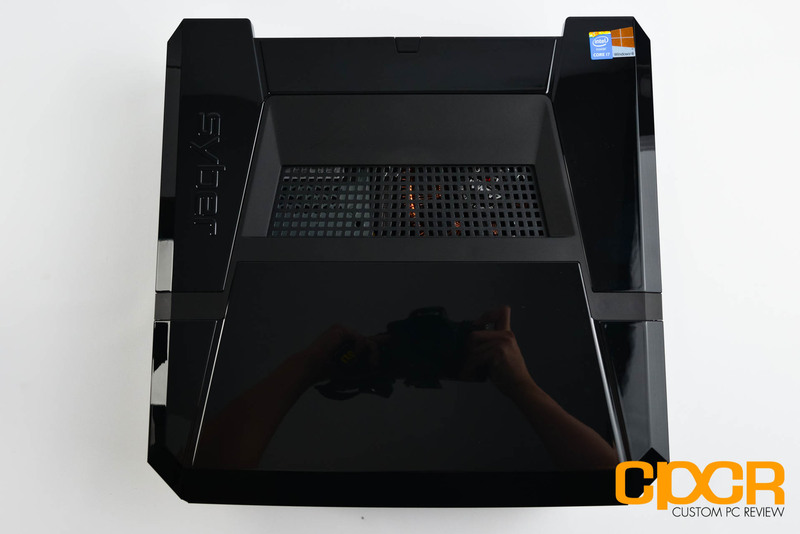 Along with top notch CPU performance, Syber also outfitted the Vapor Xtreme with the latest EVGA GeForce GTX 980 Superclocked ACX graphics card which performed very well as expected. 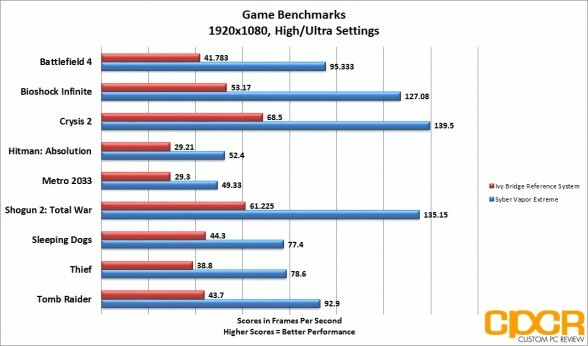 In our gaming benchmarks, the Syber Vapor Xtreme was able to play every game we tested at maximum settings at both 1080p and 1440p. 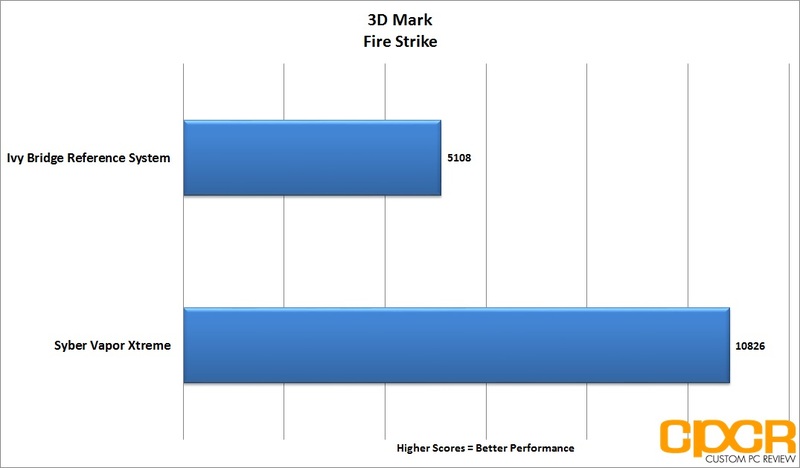 From the creators as 3D Mark, PC Mark 8 is a full system benchmark designed to test real world system performance. 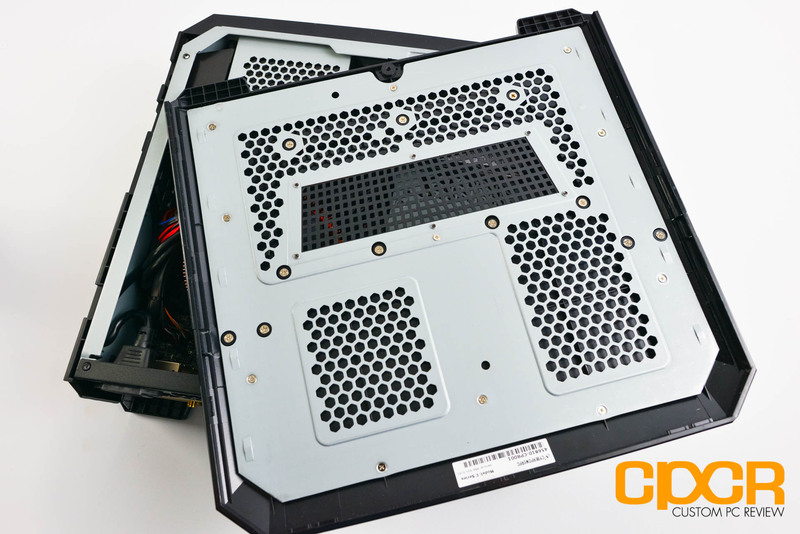 PC Mark 8 is the latest in the PC Mark series, now replacing PC Mark 7. 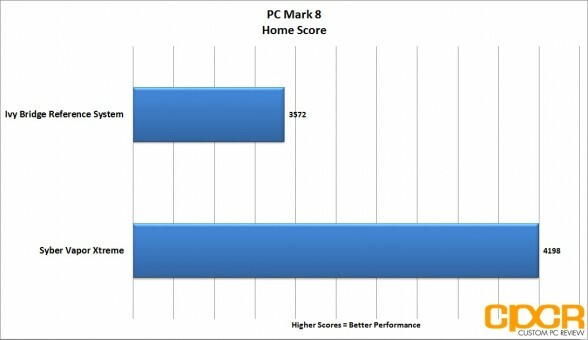 The PCMark 8 Home benchmark includes workloads that reflect common tasks for a typical home user. 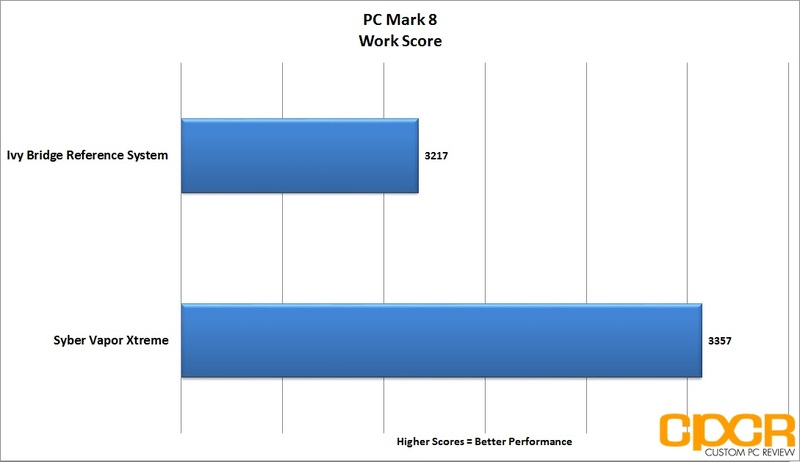 These workloads have low computational requirements making PCMark 8 Home suitable for testing the performance of low-cost tablets, notebooks and desktops. Home includes workloads for web browsing, writing, gaming, photo editing, and video chat. The results are combined to give a PCMark 8 Home score for your system. 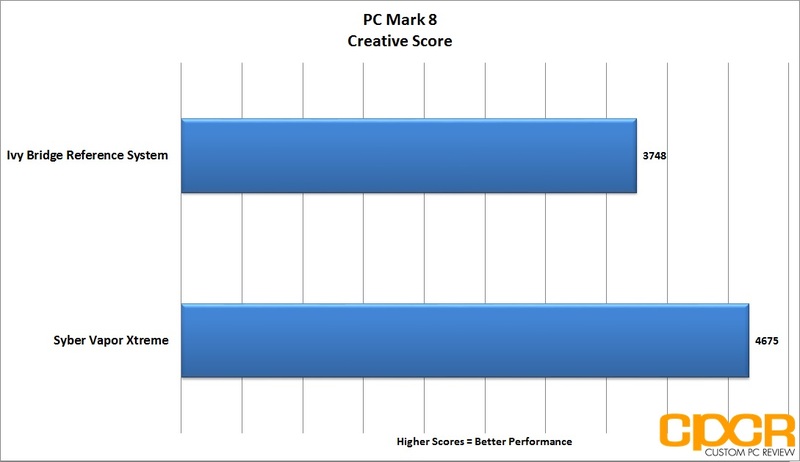 The PCMark 8 Creative benchmark includes workloads typical of advanced home computer users. With more demanding requirements than Home benchmark, this benchmark is suitable for mid-range computer systems. PCMark 8 Creative includes web browsing, photo editing, video editing, group video chat, media transcoding, and gaming workloads. The results are combined to give your PCMark 8 Creative score. The PCMark 8 Work benchmark test includes a set of workloads that reflect common tasks for an office environment, such as writing documents and browsing websites. These workloads have low computational requirements and are suitable for measuring the performance of typical office PC systems that lack media capabilities. 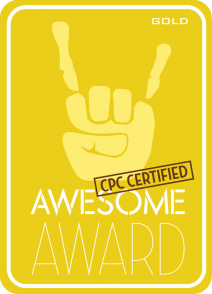 The results from each workload are combined to give an overall PCMark 8 Work score for your system. 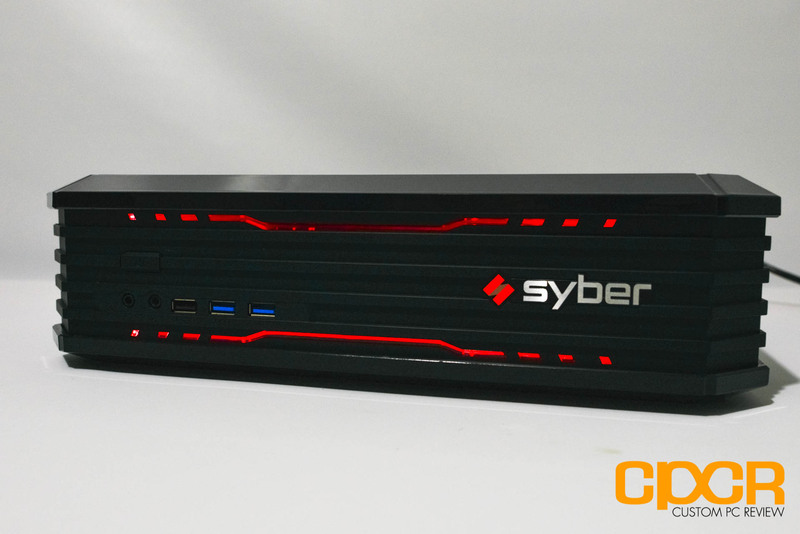 With a significantly more powerful CPU and GPU subsystem, the Syber Vapor Xtreme easily flew past our Ivy Bridge Reference System in PC Mark 8. 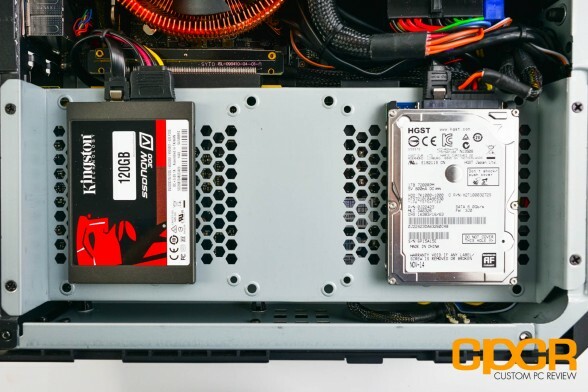 As a big proponent of having SSDs in every system possible, it’s refreshing to see that Syber went ahead and threw in a 120GB SSD for boot and a 1TB HDD for additional storage. In our sample, Syber outfitted the system with an entry level Kingston SSDNow V300 SSD which isn’t the fastest SSD on the market, but still offers significantly quicker boot times, shutdown times, app loading times, and general system responsiveness compared to a traditional hard drive. Personally I’d recommend picking up a 240GB class or larger SSD since 120GB is a bit meager these days for anyone with any sort of respectable game library. 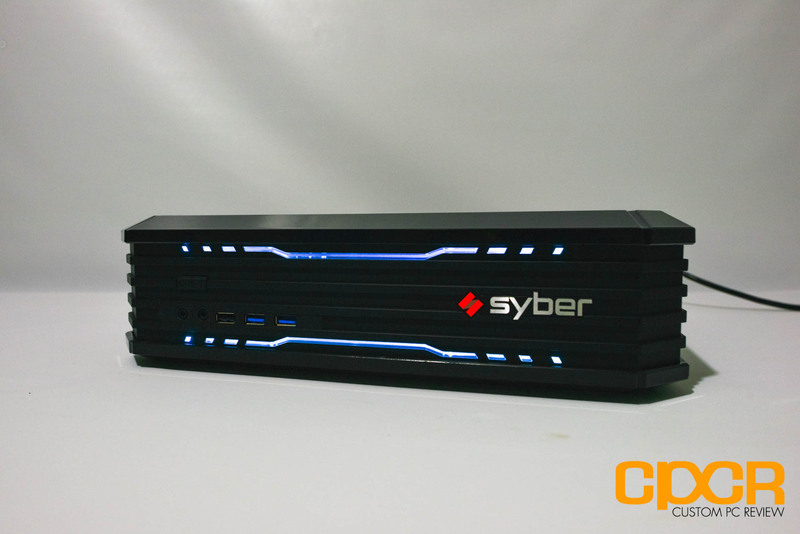 Since Syber included only a 120GB SSD, they also added a 2.5″ 7200RPM hard drive for additional storage. Performance on the drive is mediocre, as is with most 2.5″ HDDs, but it does offer plenty of storage space for music, photos, videos, etc. 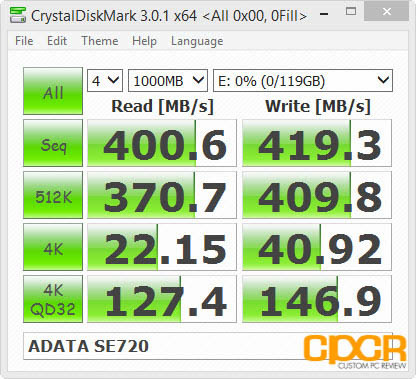 As usual, we used the ADATA DashDrive Elite SE720 128GB USB 3.0 SSD for USB 3.0 testing. 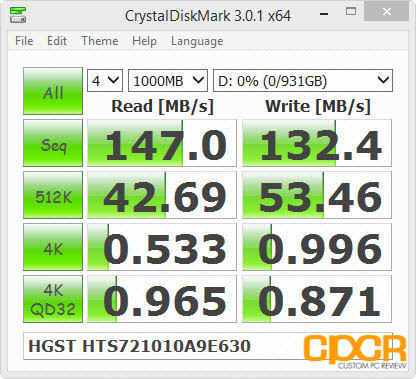 Performance here is very good as expected with the drive reaching maximum performance of up to ~400MB/s sequential reads and ~419MB/s sequential writes. Here we’ll be testing the maximum power consumption of each of the test systems shown below. Idle power consumption is taken after the system is left idle for a minimum of 5 minutes. 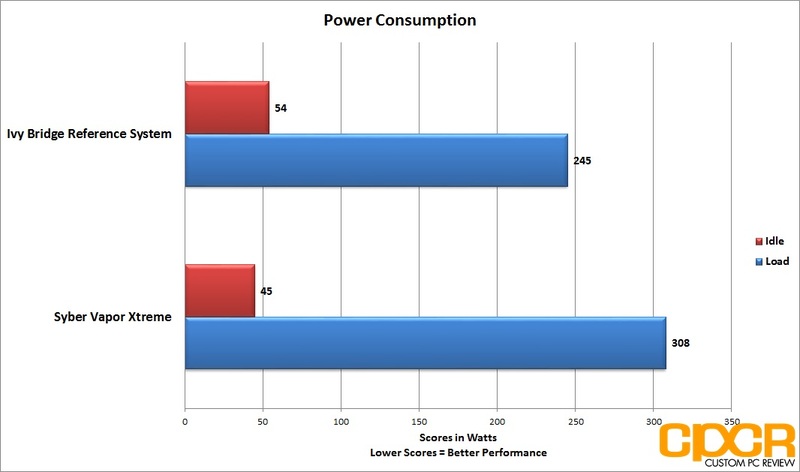 For load power consumption numbers, both Prime95 and Furmark are run simultaneously for a minimum of 5 minutes before the final results are taken. 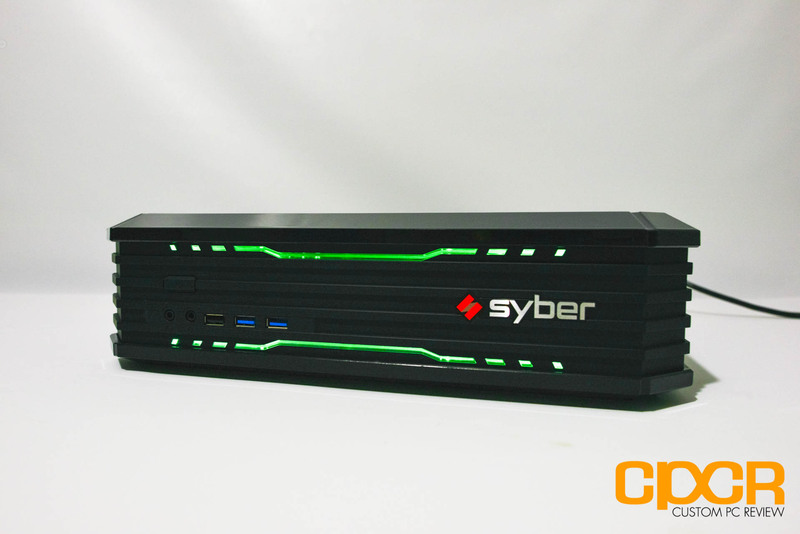 Despite being an extremely high powered gaming PC, the Syber Vapor Xtreme only drew 43w at idle and 308w at full load thanks to the combination of ultra efficient Maxwell architecture in the GeForce GTX 980 along with the Haswell based Intel Core i7-4790K processor. This test is primarily to figure out the maximum temperature the system can reach by using an artificially generated load that most users would not be able to achieve in normal testing. Temperatures are taken after a minimum of 30 minutes of running both Prime 95 and Furmark simultaneously. 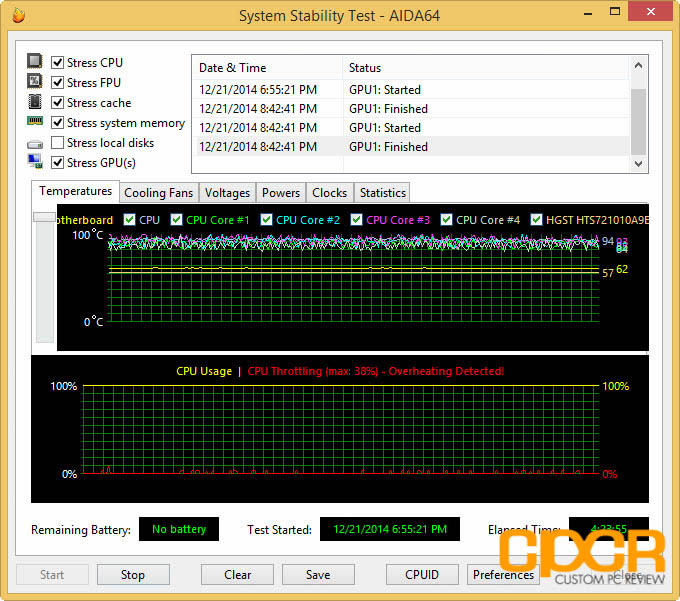 Recently, we’ve also used AIDA64’s included stress testing utility, which is nice as it’s able to stress the system in a different way compared to Prime95 or Furmark. The utility also allows us to find out when the system is throttling due to too much heat. As usual of these small mini-ITX systems, running synthetic testing at full load 24/7 definitely isn’t the smartest idea especially with such high powered components. In our Prime95/Furmark testing, the CPU managed to reach a maximum of 100ºC in which case the CPU began throttling itself to reduce heat. 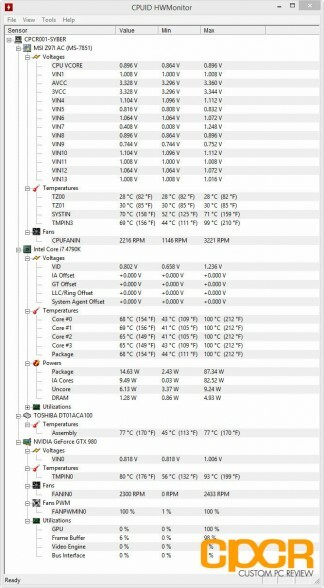 Similarly, the GPU also ran very hot as well maxing out at 93ºC after several hours of continuous torture testing. Running AIDA64’s System Stability Test, the CPU throttled to as much as 38% after 4.5 hours of continuous torture testing. With that said, synthetic workloads are designed to push hardware to the limit in a way that’s typically not possible in normal everyday use. During 3D Mark testing which is more representative of typical gaming, the Syber Vapor Xtreme was able to continuously run the 3D Mark benchmark in a loop for several hours without any overheating issues. As for noise, our sample of the Syber Vapor Xtreme is actually very quiet thanks to the Zalman CNPS8900 cooler and its massive 110mm fan. 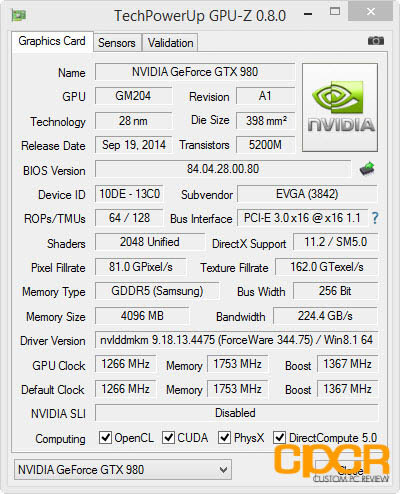 Our model also included the Superclocked EVGA GeForce GTX 980 with the ACX cooler which is fairly silent as well. During our game benchmarking, we noticed that graphics card fans will spin up to make themselves heard, but thanks to the thick casing, bottom facing GPU fans, and EMI shielding, unwanted sound is very much minimized. Ever since my first experience with PC gaming, I’ve always been a PC gamer despite having owned pretty much every console made in the past decade. 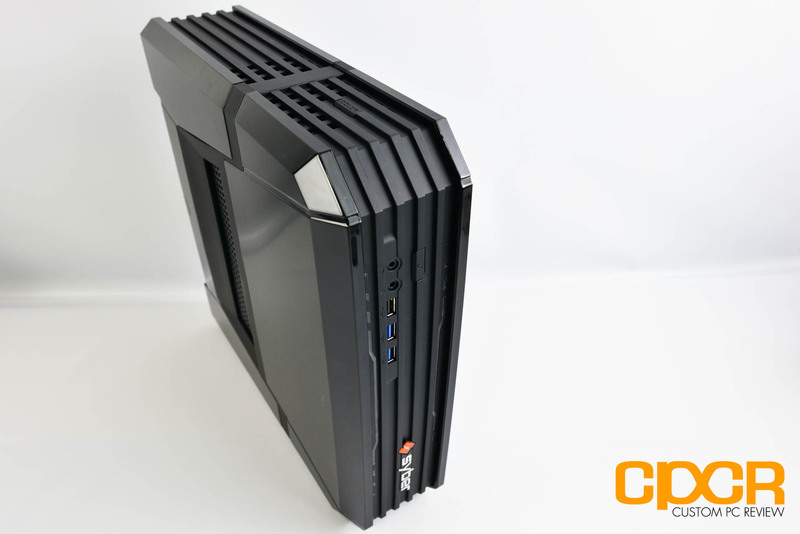 PCs are simply more powerful and more versatile than any gaming console out there, and it’s great seeing that companies are finally warming up to the idea that the PC may one day replace gaming consoles. It just makes so much sense. Ease of use is really the only thing hindering mass adoption of the PCs in the living room, and it’s really just a matter of hardware and software vendors coming together to make a product that’s easy enough for mass adoption by the mainstream. Unfortunately we’re not quite there yet on the software side, but the Syber Vapor Xtreme is definitely a great start on the hardware side. Performance on the Syber Vapor Xtreme is very much as you’d expect out of a system running flagship components such as the Intel Core i7-4790K and the GeForce GTX 980. The system easily ran our games at maximum settings at both 1080p and 1440p resolutions. Those willing to reduce AA should easily push 4K (UHD) resolutions in all but the most graphically intensive, horribly optimized games. Build quality on the Syber Vapor Xtreme is among the best I’ve seen from the company. The case is very heavy duty and components are mated very well within the system. Cables are also tucked away as well as possible, but with a chassis so small, it’s understandably difficult. Short of producing high cost custom cabling there’s very little additional that can be done. The only complaint I really have is just that I’d like to see better cooling on a system like this. While our system doesn’t necessarily overheat in typical use scenarios such as gaming or watching video, it does run hot and it does overheat in synthetic stress testing. True, most users aren’t going to run AIDA64 stress testing 24/7, but I prefer having my components running as cool as possible even if that means having a case that’s an extra inch longer, an extra inch wider and an extra inch taller to accommodate some extra fans. While I won’t count it against the Syber Vapor Xtreme since it doesn’t have an issue with more realistic applications, I do hope that Syber keeps this in mind for their next revision of the product. 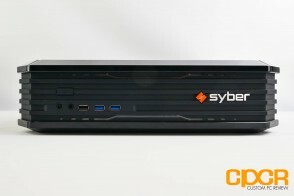 Pricing on our Syber Vapor Xtreme configuration as reviewed today is $1,681 via the CyberPowerPC website which I think is a very reasonable price for the type of hardware you’re getting. Personally I’d probably drop the Intel Core i7-4790K for the Intel Core i5-4690 given that games are more GPU than CPU dependent and it should help significantly reduce heat as well. Instead, I’d pick up a higher capacity SSD since 120GB just doesn’t really cut it when you’ve got some games like Assassin’s Creed Unity taking up 50GB storage space or more. Those who need to keep the budget below $1,500 can also opt for the Nvidia GeForce GTX 970 as well, which should still be more than enough for silky smooth, maximum setting 1080p gaming on all the latest games on the market. Just bought one of these, this is the first full comprehensive review I’ve been able to find, so thanks! Can’t wait to get this up and running for 1440p gaming. CyberPower’s customer service is iffy and rather tough to deal with, which is something to consider, as well as some of the external components (monitors, keyboards, speakers, etc.) are priced almost double on their customization page compared to market prices elsewhere. Even so, if you’re smart and pick what you order from them wisely, this system is a great deal for the power you’re getting, and there really is nothing like a strong mini-ITX PC! My advise to whoever purchase these products is to remove the bottom cover. 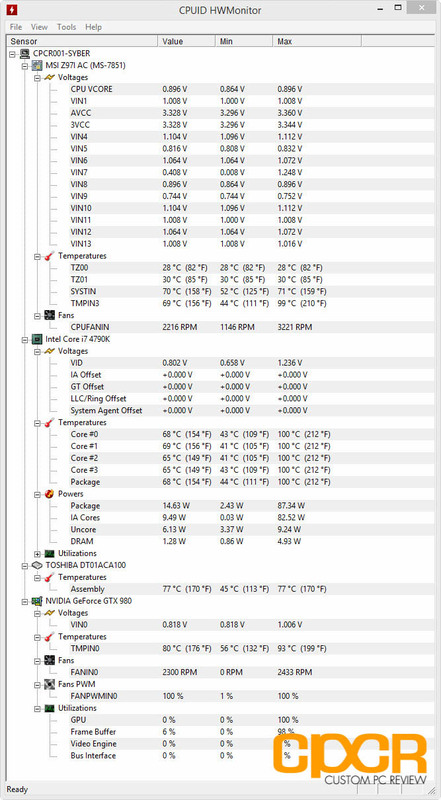 I was getting temps with GPU (MSI GTX 970) in mid 90c within 30 mins of gameplay. Once I removed bottom and put vertical I’m in mid 60c. This is a poorly designed case for airflow. I know system won’t look as nice but runs so much better. 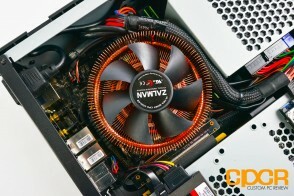 I’ve been looking to get a ssf pc as an htpc and appreciate how well written this article is with great photos. Thanks!